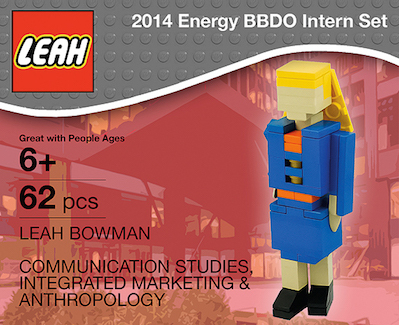 You know that weird feeling between excitement and dread that accompanies an invitation to interview? It’s especially strong when you know next to nothing about your potential workplace. However, even if the first time you’ve ever heard of the company you’re interviewing with was the day you sent in your application, you can still walk in like you’ve known about the place for years. The key is to do some pre-interview research to make sure you can handle anything specific to the company that might come up (and offer suggestions to address the company’s particular situation if afforded the opportunity). Below are some topics and strategies you might consider. Keep in mind, of course, that they will likely be researching you as well, going beyond just your resume and cover letter. So make sure you research yourself as well and clean up your online presence as much as possible! 1. The skills and experience the company values. First and foremost, you should know what the company looks for in a qualified candidate. This enables you to position yourself as the best candidate for the position. To discover the skills and experience the employer values, read between the lines of their job postings. You can also find out information on the employer’s career page to get an idea of the type of employees their desire. In addition, reach out to current employees who work there and ask them about what their employer values most in the workplace. 2. Key players of the organization. The key players within an organization are those employees who hold important positions in the company. These individuals can be managers, department directors, and especially the CEO/president of the company. You can find out who the key players of the organization by reading the employer’s “About” page and employee bios. It’s also a good idea to check out what these individuals say on Twitter and LinkedIn to learn what employees say about the company online. 3. News and recent events about the employer. When you go into a job interview, it’s always a good idea to be knowledgeable about the company’s latest news and updates. Most companies have a page on their website dedicated to press releases and events. This is a great source for you to find out information regarding the company’s latest news and updates. 4. The company’s culture, mission, and values. Job seekers should be able to confidently say they’re good fit for the company’s culture during any job interview. In fact, a Millennial Branding study says 43 percent of HR professionals believe cultural fit is the most important quality job seekers can have during the hiring process. 5. Clients, products, and services. As a potential employee, you need to have an idea of the type of work you’d be doing once hired. By having a general idea of who the company’s clients are and the types of products and services are offered, you’ll be more prepared for the interview, too. To find out the company’s offerings, you can usually find them on the company’s website. You can also read through the company’s blog, case studies, and white papers to give you a better idea of their accomplishments. To ensure you’re fully prepared for the job interview, websites such as Glassdoor help job seekers discover the inside details of a company that can’t be found on the employer’s website. With these sites, you can typically find information such as salary figures, employee functions and duties, company reviews, details about the hiring process, and more. 7. 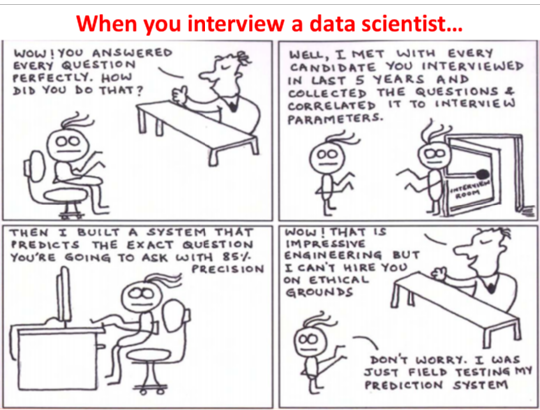 The person interviewing you. 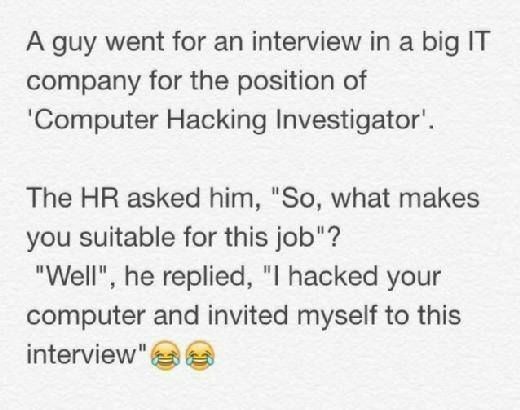 Finally, you should find out who the interviewer will be. This will give you an advantage during the interview because you’ll have a better chance of connecting with them and sparking a meaningful conversation. Now it might be a little tricky trying to find out who the interviewer is, but you should be able to locate the person’s name with a little investigation. First, try locating the person’s name from email you received regarding the interview. If you can’t find any information, reply to the email politely requesting the name of the person who’ll interview you. 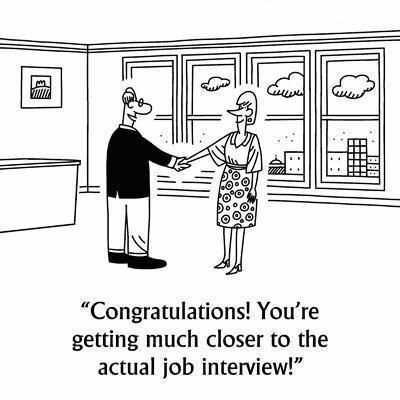 Once you acquire the interviewer’s name, do some research on LinkedIn and Twitter. This will help you learn about the interviewer’s background, their position with the company, and even some common interests you both share. 7 Things to Research Before Any Job Interview | Heather Huhman via Glassdoor. Stress interviews are a job-seeker’s nightmare—unless you’re prepared. Everything is going smoothly in your job interview. But then you’re asked why a tennis ball has fuzz. Should you run for the hills? Not necessarily. You’re likely experiencing a torturous technique called the stress interview. This method involves making an interviewee uncomfortable to see how he or she can perform under pressure. It’s especially prevalent in the tech industry. Creative companies like Google and Facebook are famous for using stress questions. They want to see if potential hires are flexible and confident. The bad news: stress interviews are increasingly common. The good news: the five tips below should help you keep cool. Don’t sweat the details. Your interviewer cares less about how you answer a stress question than about whether you can stay confident. So concentrate on your attitude, not on the specifics. Do your research. If you can, set up an informational interview with a contact inside the company to learn about the interview process and the company in general. Own it. Even if your answer is a complete disaster, stay confident and secure in your choice. Your composure will make an impression. 5 Ways to Survive the World’s Worst Job Interview | Rose Cahalan via The Alcalde. Recently landed a new promotion? Finally got that manager position you’ve been working towards for years? Been recruited by some top companies for great new roles (maybe even that dream job you’ve been waiting for)? Feel like you don’t deserve any of it? Yes? Welcome to the club! You’re experiencing the often crippling effects of “imposter syndrome.” It happens to the best of us, even the most famous and successful people out there. 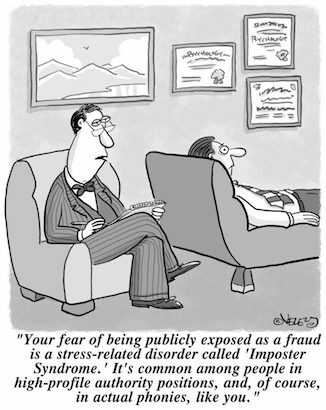 Imposter syndrome occurs when we feel like a fraud—when we feel that our successes are undeserved. We convince ourselves they’re based on luck, timing, or other factors outside of our control, instead of embracing the fact that we’re actually responsible for having made those successes happen. Imposter syndrome makes us think irrationally about our aptitudes and performance: We don’t believe we’ve excelled, and we don’t believe we deserve the rewards that come along with our success. The irony is that the further you go in your career, the more opportunities there are for imposter syndrome to rear its ugly head. You didn’t get that promotion because you earned it, you got it because you were lucky. You didn’t get to lead that project because you had the most experience on the team—you got it because timing worked out. That dream job wasn’t offered because of your stellar resume—maybe you’re just a diversity hire. The bad news is: It’s not likely you’ll ever be able to fully rid yourself of imposter syndrome. But the good news is: There are ways to combat it! You can train yourself to quickly identify it, manage it, and live to rise again. Is it your new job title? Is it a certain senior-level meeting you’ve been invited to attend? Is it a high-stakes project you’ve been asked to lead? What is it that’s making you feel doubtful? In most cases, the answer will be obvious: I don’t deserve to lead this project because so-and-so is more experienced than I am. I haven’t worked at the company long enough. I only aced my last project out of luck or good timing. That spot where you’re underselling yourself is likely the root of the problem. Pick someone you trust to talk about your waning self-confidence. If it’s a work problem, make sure to confide in someone who isn’t your co-worker or manager. Choose someone who sees you outside of that environment: He or she can identify when those feelings of fear are irrational and remind you of your strengths. If you don’t have an accomplishments box, start now by recounting your most recent accomplishments (or even better, get those achievements on your resume). Take a look at everything you’ve achieved, and reflect on all the hard work you’ve put in to get to where you are now. Embrace the fact that you got yourself to where you are. You’ve earned your spot—your accomplishments are proof of that. You did not pull a fast one on anyone. 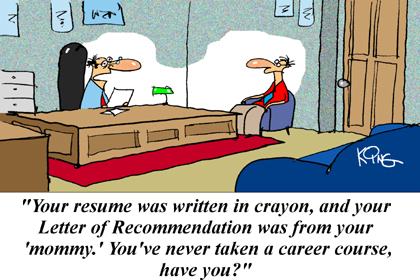 Your boss or hiring manager—who you may believe didn’t see the many gaps in your resume—is not an idiot. Don’t doubt the intelligence of those who have promoted you, hired you, or offered you opportunities. They have made deliberate choices based on your experience and potential. You really do deserve to be there. What would you do if you weren’t afraid? Write it down, say it out loud, tell someone else, and do it. The worst that can happen is that it doesn’t work. So what? Do the work and keep going. Don’t let imposter syndrome derail you from what’s rightfully yours. Do you say “I feel” a lot? How about using “I think” to start your sentences? Have you been pitching ideas prefaced with “It might just be me, but?” Rein in that doubt! Update your language with more confident, assertive phrases, and you’ll start to believe in what you’re saying. Assume your questions are valid, and that you’re probably not the only one to have them. Try: “I have a question—and I’m sure I’m not the only one.” Champion your ideas through more assertive language. Imagine you’re speaking at a conference and that you have to provide an introductory bio for the panelist moderator. 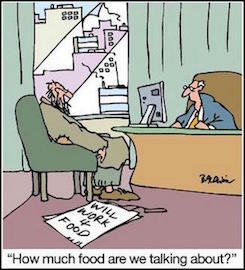 What would you say, and how would you say it? Would you tout your accomplishments or brush them off as if they were insignificant? Take an afternoon to write out your personal story. Who are you and how did you get to where you are? Let yourself shine on paper. Then, accept that it’s all true. Guess what, imposter syndrome sufferer? You have expertise to share. Share it with someone who needs it. Not only will you realize how much knowledge you really do have, you’ll also likely uncover new strengths in the process. Mentoring can reveal skills you took for granted or mistakenly assumed came from luck. It’s empowering to know you are helping someone in their journey. Famous actors, authors, artists, CEOs—the most successful people are those most likely to have imposter syndrome. 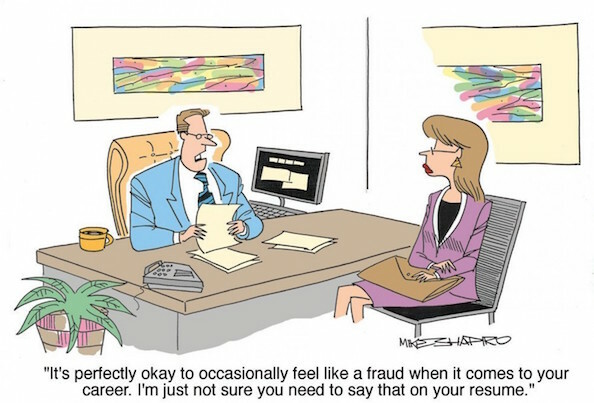 If you’re feeling like a fraud, believe it or not, you are doing something right. So play your pump up jams. Say your personal mantra. Do your power pose. You’ve got this. No matter how successful someone is or has been, no one is free from lingering doubts regarding their own abilities. 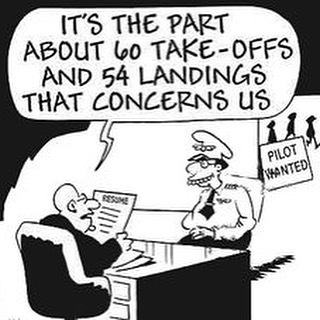 It’s easy to get sidelined by worry about your own competency, concerned that everything you have earned is due to luck, deception, or blindness on the part of managers, rather than your own talent. But whenever your confidence wanes, keep that list of accomplishments on your resume firmly in your mind… let the successes of the past serve as the foundation for your future success, not as excuses to fall short or reasons to doubt. How to Banish Imposter Syndrome and Embrace Everything You Deserve | Ximena Vengoechea via The Muse. So, you’ve passed the difficult hurdle of actually landing an interview, navigating the resume submission process and perhaps even passing an obligatory phone screen. Keen to avoid any obvious mistakes, you ask around for advice from friends, family, maybe even coworkers (or former colleagues), especially if you’re a bit of a novice at interviewing. And people are always willing to give advice, whether it’s about what to wear, what to talk about, how to answer certain questions, or what to bring along. And while undoubtedly some of what they say might be helpful, it can be difficult to determine what to follow and what to ignore. Yes, you want to look put-together and professional, but it’s more important to fit in with the vibe of the company than show up dressed to the nines. Wearing a suit when everyone at the office is dressed more casually sends the message ‘I don’t understand your culture. An easy trick: check out a site like Glassdoor to get a feel for the office culture, and dress one or two steps up from that. 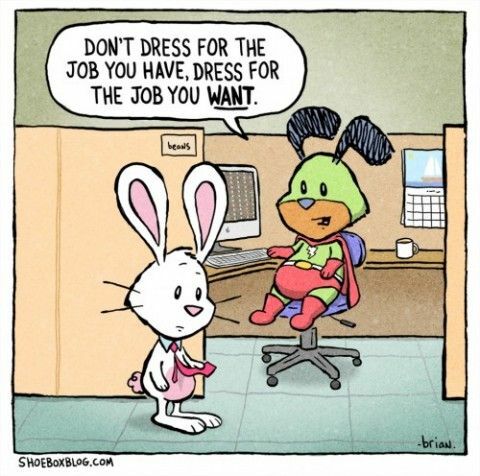 Dressing appropriately shows your interviewer that you took the time to research and understand the company, which ultimately tells them you care. While arriving late to a job interview is definitely a huge no-no, experts agree that arriving too early can also hurt your chances at landing the job. There is a fine line between showing interest and looking desperate, and you don’t want to send the wrong message. Arriving more than 15 minutes early can be frustrating for a hiring manager especially because it could throw a curveball into their schedule. Instead, if you want to make extra sure you arrive on time, head to a coffee shop in the area of the interview early and hang tight there until your scheduled time. Everyone has heard the classic advice to say something that’s actually a strength when asked what your biggest weakness is. But while this may seem like a sneaky way to make yourself seem more qualified, it actually comes off as fake and cliché. You’re missing an opportunity to demonstrate self-awareness and a willingness to adapt. Instead, honestly explain one of your weaknesses, then say what you’re doing to fix it. This way, instead of presenting a problem, you’re presenting a solution. You want to show your interviewer why you’re the best person for the job, not wait for them to figure it out on their own. 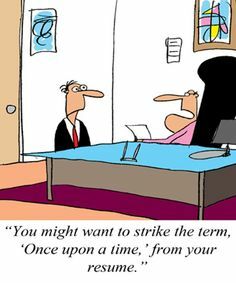 It’s your job as the candidate to figure out what the hiring manager is looking for and tell a story that shows you meet those requirements. You should never lie or present a false version of yourself, but it’s important to play up your best features and make a memorable first impression. Don’t fool yourself into thinking you can just be who you are. You need to nail those first few seconds by carrying the right props, sitting in the right place, and handling the handshake properly. Staying silent throughout the interview process about salary could send the signal that you’ll be happy with any job offer they make. While you don’t want to put money first, asking about the pay range for the job sooner rather than later can save you countless wasted hours and energy on a job that won’t pay what you want. So, any of this sound familiar? Amazing how what people say over and over again can so frequently be wrong. Of course, your own experience may vary, especially if you’ve already interviewed with many companies over the course of your career. But when you’re just starting out, always remember to dig a little deeper into conventional wisdom; sometimes it pays to not just follow the crowd. When it comes to getting the attention of potential employers, being a little out there can be a good thing – but a little goes a long way. Here are four do’s and don’ts for job seekers hoping to stand out for the right reasons. There’s “crazy good” – and then there’s just plain crazy. When it comes to getting the attention of potential employers, being a little out there can be a good thing, but a little goes a long way, as some candidates have found out the hard way. A recent study about unusual job seeker efforts to stand apart, conducted among 1,078 hiring managers, makes it clear that some job seekers don’t know where to draw the line between getting noticed – and getting notoriety. …found out where the hiring manager was having dinner and picked up the tab. …lit a corner of their resume on fire to show their “burning desire” for the job. …answered a call during the interview stating that another company was calling to discuss a job offer. …sat on the floor during the interview and asked the hiring manager to take a picture of him with the company mascot. …tried to impress the hiring manager with the history of the business, which was incorrect. …showed pictures of their relatives working at the company many years prior. …acted like a game show host. …brought a bag of props into the interview and pulled them out as they were relevant in the questions/answers. …sent the hiring manager a coupon for free meal. 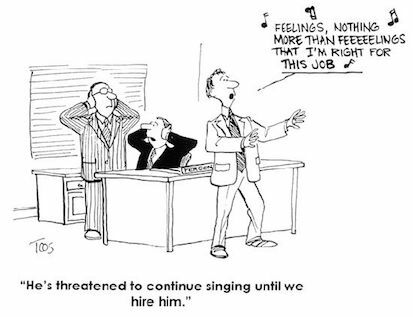 Hiring managers gave a mixed bag of reactions when it came to whether they thought job seekers’ off-the-wall tactics were effective. On one hand, candidates should get props for trying to stand apart among the sometimes hundreds of others vying for the same position. Unfortunately, “props” don’t necessarily equate to employment. So how can you as a candidate get smarter about your own methods for standing out – and get real, positive attention for your efforts? DO know your audience. What charms one hiring manager may turn another off. You can’t always predict what will work for one company and what won’t. Just keep in mind, however, that a company that doesn’t appreciate your unique line of thinking might not be the company that’s right for you. DON’T overthink it. Sometimes the simplest approach is the best approach. Many of the hiring managers we surveyed were blown away when a candidate sent a handwritten thank you note. So shine on, you (not too) crazy diamond – and best of luck in landing that next job.